Scrutiny of Huawei's business practices intensified as Polish authorities arrested Mr. Wang Weijing, an employee of Huawei, along with a former Polish security official on spying allegations, according to Reuters. The report states that the former Polish security official is currently employed by Orange Polska. 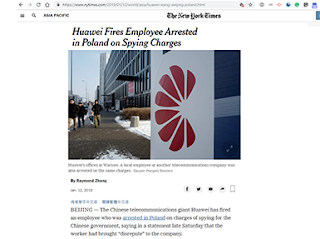 Later, Huawei spokesman Joe Kelly was quoted by the New York Times saying that the company had terminated the employment of this person because his actions "brought Huawei into disrepute." The news follows the arrest of Huawei's CFO in December in Vancouver based on an extradition request from U.S. authorities. Ericsson and Qualcomm completed a non-standalone (NSA) 5G New Radio (NR) data call using the 2.6 GHz band. The bi-directional downlink and uplink data call was made at the Ericsson Lab in Kista, Sweden last December 20. The lab demonstration used Ericsson’s commercially available 5G hardware – including its 5G NR radio AIR 6488 and RAN Compute products – together with Qualcomm Technologies’ mobile smartphone form-factor test device powered by the Snapdragon X50 5G modem and antenna modules with integrated RF transceiver, RF front-end and antenna elements. Ericsson said the successful test brings a new sub-6 frequency band one step closer to commercial rollout. Ericsson and Deutsche Telekom demonstrated a millimeter wave link with a data transmission rate of 40 Gbps. The live trial covered a hop distance of 1.4 kilometers in the millimeter wave (E-band) spectrum. The technical setup included Ericsson’s MINI-LINK 6352 microwave solution and Router 6000. The round-trip latency performance of the link tested was less than 100 microseconds, confirming the positive contribution of wireless backhaul technologies to satisfy network-specific latency targets. The joint innovation project, which was conducted at the Deutsche Telekom Service Center in Athens, achieved four times greater data throughput compared to current commercial millimeter wave solutions to prove the commercial viability of future wireless backhaul technology. The test also focused on the stringent latency requirements in 5G network architecture to support low latency or ultra-low latency use cases. Worldwide semiconductor revenue totaled $476.7 billion in 2018, a 13.4 percent increase from 2017, according to preliminary results by Gartner. Intel’s semiconductor revenue grew by 12.2 percent compared with 2017, driven by a combination of unit and average selling price (ASP) growth. Major memory vendors that performed strongly in 2018 include SK hynix — driven by DRAM, and Microchip Technology — due to its acquisition of Microsemi. The top four vendors in 2017 retained their ranking in 2018.